The history, nature, geology and mythology of the Ammer whitewater river on the Schnalz summit in Peiting is revealed on eight colourful display boards along this educational trail. The trail, developed by Jutta Brennauer, brings knowledge, aesthetics and art together in a unique way. It is intended to encourage visitors to view the natural beauty of the Ammer with a watchful eye and to treat it with respect. The educational trail incorporates the themes of geography, history and the flora and fauna of the Ammer Valley. These are supplemented with the themes of “stories and myths” and “recovery and nature conservation”. The eight artistically designed information boards, which blend in perfectly with the natural surroundings, present these subject areas. The starting point for this somewhat different walk is located by the car park for hikers on the Schnalz, along with the first information board, which displays the route. The walk takes approx. 1 hour (fur the Ammer route only). If you have a little more time, we can also recommend the Schnalz panoramic trail. In addition to the Ammer route, an extra tour veers off here in the direction of Böbing. 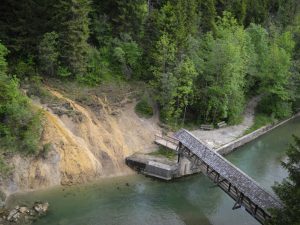 The Schnalz panoramic trail is over 10 km long and should not be undertaken after prolonged periods of rain, as the path can often be muddy and very slippy. You can take a scenic break on the gravel banks around the Kalkofen footbridge.